This particular mix was made during the peak of my mixtaping career, the late 90’s. I created a series of mixtapes for my buddy, Dan, that I thought was clever to title For Those With Hears To Ear. I was responsible for helping this friend transition from Christian metal to Christian alternative (as well as falling in love with his mom’s Beatles records…but that’s a different story)… and the For Those With Hears To Ear series was my attempt at keeping him up to date with the latest and greatest Christian alternative rock that I was digging into. I can’t really tell from the pics which volume number this particular tape was…I’d have to go find the tape in storage and see if it’s more readable than it appears in these pics. I’ve written kinda extensively about just how important that music niche was to my youth group days…so at this point… I’ll just dig into the mix of tracks for you here. I doubt you want to take the time to read about every individual track… so I’ll just try and hit the highlights for you. 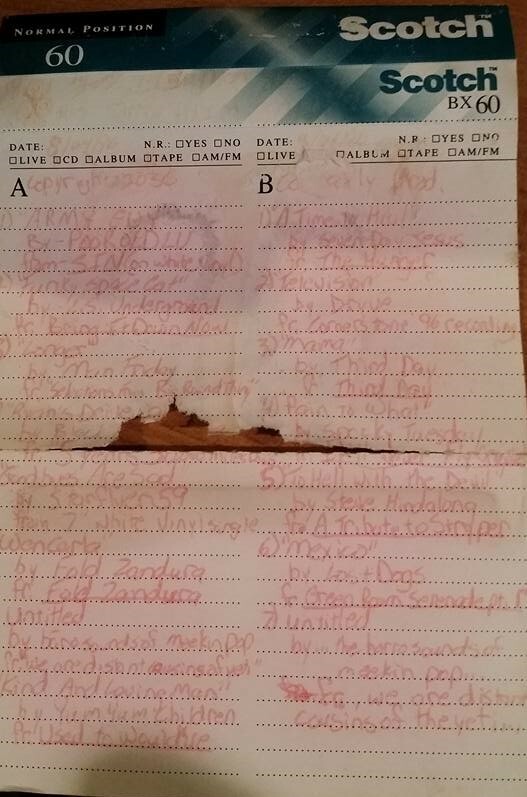 One unique thing about this particular tape, was the inclusion of some somewhat “rarities” that I had acquired in 1996, specifically from the Cornerstone music festival I had attended that summer. 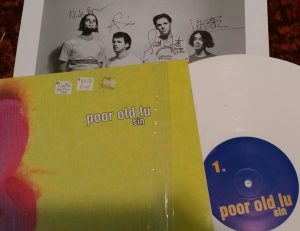 Things kick of with one such rare track… specifically, the “bonus” track from the white vinyl release of Poor Old Lu’s Sin. I felt fortunate to find a copy of that rare vinyl release from the Rad Rockers booth at the festival… because I was trying to build my own record collection, (even in the mid-90s, almost 2 decades before the hipsters thought it was cool)… and nothing seemed more exciting than getting my favorite album by my favorite band on vinyl, and having them sign the inner picture. (Although listening to the record was a little disappointing because it sounded kinda muddy and distorted… I always figured records pressed during the 90’s were more “novelty” and so they weren’t properly mastered for vinyl release… or maybe it’s just my copy or bad record player). Army Guy was a great inclusion because it was only available on this limited vinyl release, not on the CD or tape versions of the album. So I was quick to share this special piece from my collection with Dan on this mixtape. Next, I want to kinda highlight something else I consider special to this mix. One of the things I had come to develop as a sort of “signature” to my mixtapes, was the inclusion of special clips and bits that were meant to add a bit of humor and “character” to the tapes. Often, these bits were just audio pulled from a television or movie source. On this particular tape, I pulled some clips from a tape I had recorded from television earlier in the decade. In a way, the inclusion of these clips ties together 2 things I’m currently obsessed with: 90s Christian alternative music and cartoons from my childhood. I’m not going to go into any more details concerning the source material these clips were pulled from… but I hope some of you are close enough to my age to appreciate my tying these two eras of my youth together. And feel free to give a shout out if you recognize any of them. The second song in the “track list” is a rarity by LSU, aka Lifesavers Underground, one of many monikers/bands/projects taken on by Michael Knott… one of Christian alternative’s favorite under recognized darlings. Knott’s work was very prolific at this time, and this particular track was a “previously unreleased” song from the collection/compilation Bring It Down Now…cwhich was a bit off a disappointment to me at the time. Advertising for the release boasted not only unreleased tracks like this one, but also tracks from out-of-print albums that I needed in my collection. While it did live up to those promises, it disappointed in the way it presented the songs… least offensively, it segue-ed/faded each track into the next one (as you can hear feedback from the previous song fading out as Funky Space Cat begins and then the “banter” from the beginning of House of Love fading in on the end of FSC on this tape) and worst of all, some of the essential out-of-print tracks were actually “remixes” which were just a mess a garbage ‘dubbed’ over the original song… and then the ‘hidden’ tracks were all just a busy signal repeating for a beyond obnoxious amount of time. The whole thing was supposed to be an artistic way to present a ‘best of’ sort of collection… but the avant-garde approach was just wrong for someone like myself, who was just trying to get an archive of otherwise unobtainable material. At least a few tracks like Funky Space Cat made the purchase worthwhile, if overall disappointing. Now that I’m over 800 words in and only on track 3… you expected it to take the entire 1 hour of the mixtape to read the write up… right?? Track 3 is another rarity… an independent cassette that I picked up at C’Stone that Summer. I don’t know much about the band Man Friday…seems like someone from the band showed up somewhere on Facebook at some point and couldn’t even fully explain how Dug Pinnick ended up on that project…but seeing that the bass player from King’s X was involved was what motivated me to buy the tape. Another independent cassette I bought at that festival, due to association, was Meekin Pop’s We Are The Distant Cousins Of The Yeti… this one purchased for supposed inclusion of Poor Old Lu’s Nick Barber. 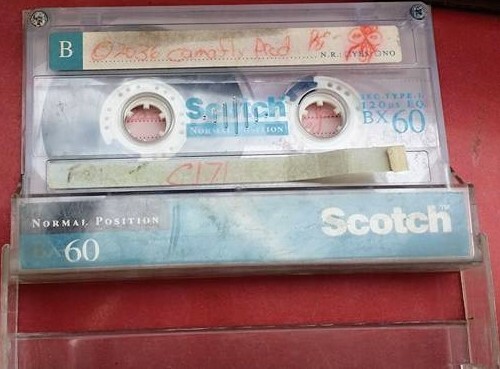 In 2015, I posted a picture of that tape on Facebook, and tagged some Lu members, who tagged Nick, who tagged other members of the band…and long story short, was sent mp3s of the demo’s songs by the band. They have a FB page and apparently play some shows and have possibly recorded some other stuff since then. Turns out, there were a bunch of us who had bought that cassette at some point… as it keeps coming up in FB group I’m part of. This volume of FTWHTE features a number of artists from the 5 Minute Walk Record label…an ‘indie’ label that made a big mark in the genre/scene in a short amount of time. 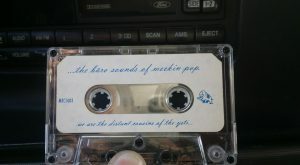 Artists like Black Eyed Sceva, Yum Yum Children, Seven Day Jesus, and Dryve might not have had long careers, but the albums represented by the songs on this mixtape have endured as favorites from that era. I first heard BES and YYC when they toured with Poor Old Lu, and saw all 4 of those bands a couple weeks later at Cornerstone. The Dryve song included here is actually a recording from one of their sets at C’Stone that I recorded with a tape recorder I kept in my pocket. Most of those bootleg recordings sound terrible, muddy and overdriven/distorted… but I just had to include Dryve in this mix and their album wouldn’t be release for several months. Also of note, my future band, Daughter Silas, would end up covering the Seven Day Jesus song, A Time For Healing a couple years later… and listening to the song now, I’m reminded just how much that drummer’s style impacted my approach to the instrument… he and Poor Old Lu’s (have I mentioned that band yet?) drummer, who has turned out to be another Facebook friend in recent years. Actually, I’m also FB friends with Dryve’s drummer too. It’s kinda fun making contact with these musicians that I admired as a teenager. Selections 3 and 4 on side 2 of the tape are from a couple CDs I had purchased prior to that summer, while my band was touring for Spring Break (don’t worry kids… instead of heading to sandy beaches and wild parties for Spring Break, we headed to the Northwest states of Oregon and Washington where we rocked church youth groups. SPRING BREAK ’96 BABY!) Mama is from Third Day’s debut album… I kinda thought it was the most rockin’ song from the very Hootie & the Blowfish sounding disc (or Hootie and the Pearl Jam as a friend of mine called them). “Pain To What” came from a new band called Spooky Tuesday. At the time, I knew nothing about the band, but Gene Eugene had executive produced the album, and it sounded great to me. Not every song was a total winner…the album covered a lot of territory… but the songs that I liked I LOVED. Another semi-rare track on the mixtape was Steve Hindalong’s cover of To “Hell With the Devi”l from the Stryper Tribute album put out on Flying Tart records. This was an interesting tribute record…mostly alternative acts giving somewhat ironic yet still sincerely respectful renditions of songs from Christian music’s most notorious metal. Indie Hindie’s track was a bit of surprise being that he’s actually the drummer and principle songwriter for The Choir (and also happens to be another FB friend of mine these days), and this track was a chill acoustic take on the upbeat anthem. So I was trying to catch up on some of these by downloading them and taking them in the car with me… I keep getting the “network error” warning and it won’t let me download them.